A report from Trulia on Tuesday offers some hard solace for would-be homebuyers priced out of hotter housing markets. Across the U.S., the report said, it’s 23 percent cheaper for a young household to buy a home than to rent one. 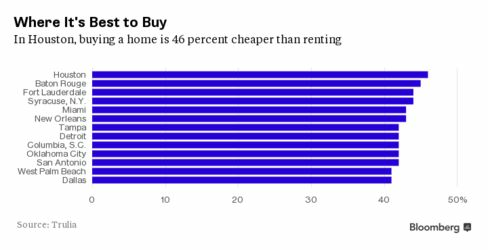 But in San Jose and Honolulu the advantage to buying is nonexistent. In New York and other expensive cities, the advantage to buying will likely disappear once mortgage rates finally rise. 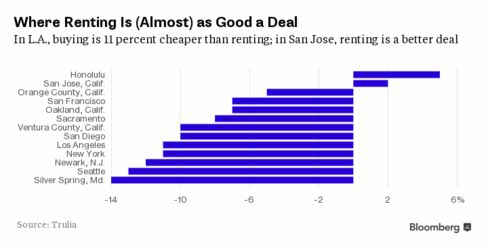 Trulia compared the median costs of buying and renting and found that San Jose and Honolulu are the only two U.S. cities where renting is a better deal. Trulia’s researchers factored in down payments, property taxes, security deposits, and other costs, as well as expected home price and rent appreciation, when comparing renters and buyers. They assumed for their analysis that millennial buyers can afford to put just 10 percent of the sales price as a down payment, and that they’ll stay in the home for only five years. While Trulia’s rental data extend back only to 2012, Ralph McLaughlin, a housing economist at the company, says you probably have to go back to the 1980s—when mortgage rates hung out in the double digits—to find a time when renting won out over buying in most U.S. cities. 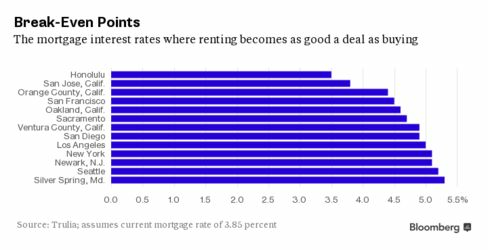 Rising rents may make the outlook bleak for young workers in many big cities, but renting is going to look better compared with buying as interest rates rise. Meanwhile, here are the metros—mostly in the South and Midwest—where buying a home instead of renting proffers the biggest cost savings.